Indonesia we are coming ! As we left Singapore with great memories, we were now heading to Java island which is an Indonesian island located after Sumatra and before Bali. Indonesia will be the country where we will be spending the most time during this world trip; 6 weeks in total, as there are tons of beautiful islands to discover – more precisely 17’000 in total! We will of course not be able to visit all of them but we will for sure go to Java Island, Lombok, Gili Islands, Flores and Comodo islands finishing with Bali. Indonesia is an expended country with a little less than 2 millions inhabitants. The currency is the Indonesian Rupiah and the language Bahasa. The capital is Jakarta which will not visit as it doesn’t seem to be a big attraction to us. We will certainly focus on visiting nice beaches, volcanoes, smaller cities and of course take time to dive! The country has amazing spots for diving and snorkeling. Indonesia will be also the time where we will see Lydie’s dad and later on Ana, a common friend. 🙂 We are really excited about seeing people from home and spend some valuable time with them. In the meantime, the first stop is Yogyakarta. This city is a top destination to go visit the Borobudur and Prambanan temples. These are two beautiful UNESCO sites some kilometers with lots of history. As we landed in Yogyakarta, we thought the airport was a joke. A room no bigger than 150 sq feet to welcome two incoming international flights. The lines were huge, people running into each other with only one convener belt for all of the luggage and four immigration officers. On top of that 30 degrees Celsius and no Air Conditioner. It was definitely not fun at all but we made it through. Once settled in our nice guesthouse Alam Citra B&B owned by a very friendly local family, we were able to figure out with the owner’s son, how to visit the area. There are few sights to visit in the city but they close at 2 in the afternoon, so no time to go that day. Next day we decided to visit the Borobudur temple, known as a major attraction. It is one and half hours from Yogyakarta. The temple has 504 Buddha statues surrounded by bells and it’s considered the world’s largest Buddhist temples. We could climb up to the top for a nice peripheral view around. However, to be honest with all of you, after visiting Angkor Wat in Cambodia, the “WOW” effect we had for the site wasn’t that big. Don’t get us wrong, it was still beautiful in its own way. 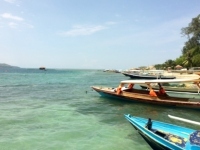 The following day, not wanting to pay another $20 dollars each to see Prambanan temple, which is even smaller than Borobudur, we headed instead for the beach 25 Km from the city. We rented a motorbike and in less than a 30 minutes ride, we were there. We really enjoyed a relaxing sunny afternoon on a black sand beach surrounded by local people and good little restaurants. It is very dangerous to go swimming though as the waves were big and rough. We decided to relax and figure out how to get to the Bromo volcano with our dear friend the Lonely Planet and TripAdvisor. Why to go the Bromo volcano ? It is a beautiful volcano where the crater is still active. The landscape is breathtaking, specially at sunrise. We found tons of packages that tourist offices offered from Yogyakarta to get to the Bromo volcano. However, after having read many reviews with horrible comments such as bad hotels, never ending bus rides, package not including all of the prices, obligatory tips etc etc we decided to make the way on our own to Ceromo Lawang, the village nearest to the Bromo. Trains in Indonesia are super nice and clean and easy to travel with. We decided to take a train first to Surabaya. Booking our train tickets was easy on www.tiket.com. We just had to print the ticket once we got to the train station. We stayed one night in Surabaya to catch the train to Probolinggo the day after. Next day we woke up early, did some yoga and headed over the station to catch the 9 AM train for a two hours ride to Probolingo. 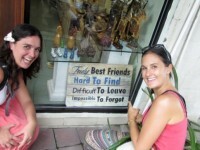 One of our favorite parts of trip is meeting new people and making new friends. As we got to our destination, we were lucky to meet three more travelers, one guy from Spain, and two friends traveling together, one from Brazil and the other one from Belgium. We all hit it off right away and decided to go together as a group to Bromo. The weather was a lot cooler and dry but the atmosphere around was quite unlike anything we have ever seen. Beside the unwelcoming staff in our hostel at Cafe Lava, everyone else was super friendly and nice to share their story about the volcano. We talked to two nice guys from Singapore who shared with us how to hike to the viewpoint and go to the crater of the volcano without paying for a jeep rental. We were lucky to get this information as the hotel wanted 500,000 IDR ($42 dollars) for the jeep rental plus 220,000 IDR ($20 dollars each) for the entrance fee, which we all thought was outrageous as it’s only a 15 minute drive to the crater and 10 minute drive up to the viewpoint. Here it’s a map on how to walk to the crater from the town. It’s only a 30 to 45 minute walk depending on your own pace. It’s very easy and safe, just a bit dusty. 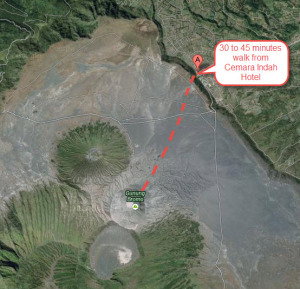 Head over to the Cemara Indah hotel, on the right side go to the walkway through the fence down, then walk 30 minutes to the crater. We visited the crater that afternoon and it was definitely something we had never seen before. The smell of sulfur and the constant cloud of fog from the volcano left us speechless. There are no really words to describe the feeling while there but the pictures will tell it all. As the alarm clock went off, we couldn’t believe we were waking up at this time but we quickly got ready and met with our new friends and started the hike. It was pitch dark black at the time, but with our head lamps we were well equipped to take a 2 hours hike. At our arrival at the view point, we saw there other travelers and were definitively not at all alone. Even though it was a bit foggy, we were still able to enjoy the view which was no more than amazing. what else can we say? Again, the pictures say it all. – Yogyakarta: Great stay at Alam Citra Bed and Breakfast, 11 Km from city center, 300’000 IDR double room/ night, free airport pick-up and breakfast included. – Borobudur and Prambanan temples: 100’000 IDR for both temple or 75’000 IDR for 1 temple. $20 entrance fee for Borobudur and $18 for Prambanan. – Train tickets: On www.tiket.com. Easy and fast, tickets to be printed at the train station. – Surabaya: Cheap hostel for overnight at Loxy Inn, close to the train station. 200’000 IDR/double room/night. 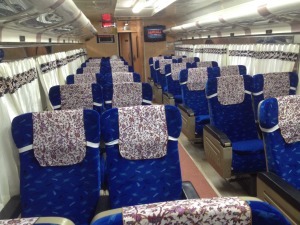 Another option to get to Probolinggo is the night train from Yogyakarta departing at 11pm. 1. Once in Probolinggo, green vans available from the bus station for only 35,000 IDR or private mini van for 300’000 IDR. 2. Go see the sunrise on the Mt. Pananjakan with the view on the Bromo Volcano. The hike takes 2 hours and everything is free. Otherwise Jeeps are available for 100’000 IDR/person + “entrance fees” at 220’000 IDR/person.